Join us on the spectacular Sarria to Santiago leg of Camino de Santiago and help raise funds for St James’s Hospital. 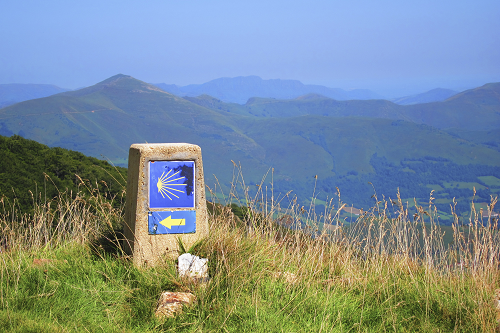 This walking tour of the Camino de Santiago is perfect for those looking to capture the essence of the Camino: a nice walk, good food & wine, discovering local customs, meeting fellow pilgrims and enjoying the unique atmosphere of it all. You won’t forget a single minute of it! This section of the Camino will take you across woodlands, farmland and rustic hamlets, following tracks and paths lined by granite stone walls. The green rolling landscape of Galicia is part of each day’s walk, until you approach your final destination: the mythical city of Santiago de Compostela. Get your ‘Compostela’ certificate and explore the magic of Santiago’s Old Town. Return Flights From Dublin to Santiago de Compostela. Accommodation (Half Board based on Twin sharing). Fully guided tour & historical notes for each section of the walk. Sarria is the most popular starting point of the Camino de Santiago with thousands starting their journey here every year. As you explore the town centre where you will find churches, chapels, monasteries and 7 pilgrim hospitals. The main street, Rúa Maior, has a nice atmosphere where you can relax while enjoying a drink or bite in one of the nice cafes scattered around the town. Visit the Igrexa de Santa Mariña with its evocative pilgrim mural, the castle fortress and the Magdalena Monastery. Today expect a calm walk through pretty villages and peaceful hamlets under the shade of oak trees on quiet country roads. Along the way, you will spot many Galician traditional ‘hórreos’ (granaries). Visit the beautiful Romanesque church in the village of Barbadelo. You will start from the lovely village of Portomarin today. The Camino will cross the river Miño and rise uphill steadily towards the Serra de Ligonde. You will pass nice hamlets such as Gonzar and Ventas de Narón. Stop to visit the Romanesque Church of Santa María in Castromaior and the Romanesque church in Eirexe, with its portal featuring a sculpture of Daniel with animals, as well as Pilgrim Santiago. Today the Camino trail continues downhill, passing the village of Casanova and the delightful village of Leboreiro. You should take a break in the lively market town of Melide (454m), where you should try octopus, Galicia’s most classic dish, in one of the many ‘pulperías’. The Camino crosses several streams and follows a forest track bringing you to the village of Boente with its church of Santiago. Next is the pretty medieval village of Ribadiso and finally the town of Arzúa (389m). In Arzúa, you should visit the churches of Santa María and A Magdalena. Today’s Camino walk will take you through pretty woods, sleepy villages and across streams most of the day. The chapel of Santa Irene, with its unique statue of Santiago, is worth a visit. En-route, don’t miss the lovely hamlet of Rúa (310m). The rest of the route to Amenal is along a mix of good and calm country roads and forest tracks. After Amenal, your next point of interest is Lavacolla in the outskirts of Santiago, where pilgrims used to wash themselves in the river in preparation for their arrival in Santiago de Compostela. Rows of tall eucalyptus trees line your journey to Monte do Gozo (‘Mount of Joy’ 368m) and it is from here that you will catch your first glimpse of the Cathedral of Santiago. When you arrive in the city (264m, population 80,000), explore this UNESCO World Heritage Site’s architecture and delight in the wonderful atmosphere of this spiritual and cultural mecca. With only 14km today, you should be in Santiago in time for the pilgrim mass. Take time to explore this gem of a city, small and vibrant. Its UNESCO listed old town will enchant you. In Santiago de Compostela you will find not only pilgrims but also locals and students, socialising and enjoying a few bites and glasses of wine in the many bars, restaurants and cosy cafes. Following breakfast there will be an opportunity to explore the old city of Santiago and take in mass in the square (flight time permitting) before departure home. The 1000 year old pilgrimage to the shrine of St. James in the Cathedral of Santiago de Compostela is known in English as the Way of St. James and in Galician as the Camiño de Santiago and is one of the most famous pilgrimage walks in the world. Over 100,000 pilgrims travel to the city each year from points all over Europe, and from other parts of the world. Interested? What to learn more?